The Konnekt Skype-based phone is a dedicated appliance that makes it incredibly simple to make or receive Skype phone calls, Skype video phone calls and Skype calls to telephones. We’ve designed the Konnekt Skype-based video phone for those who want a device that’s even easier to use than their regular telephone but adds Skype video phone-calling and Skype phone-calling. There’s no keyboard or mouse. No complicated swiping or dragging. Just touch a contact button to make a call! The buttons are BIG, the phone is LOUD, and the screen is LARGE enough to see from across the room. It’s always ready for you to use — with just one touch of the screen. Skype phone calls are easy with your Konnekt. The Konnekt Skype-based phone is much more than a product. It’s backed by our full service. 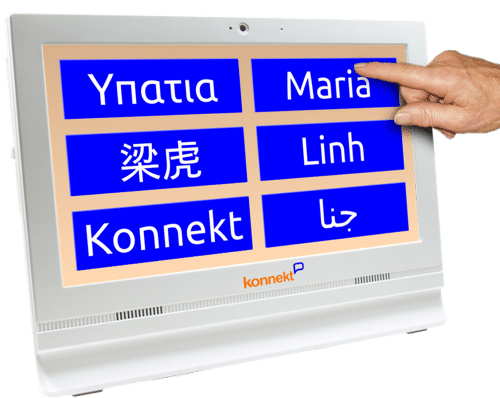 Konnekt does it ALL for you: We set up your contacts, personalize buttons and messages (in any language) and customize volume and ringing so that it fits your needs. For help, just contact us or touch the big Konnekt button. We can make changes remotely, without the need to visit. Skype video phone calls are simple! No need to start a computer, fiddle with a tablet or squint at a Smartphone. The Konnekt phone is easier to use than a regular telephone. MUCH easier. Many of our users are over 80. Their sons and daughters simply want to be able to see them more often, or check in on them visually when they don’t answer the phone. Calls any Skype device, worldwide. Call the Konnekt from the Skype app on your mobile, tablet or computer. HUGE one-touch Call buttons. Completely replaces and simplifies the user interface. No menus, icons, drop-downs, pop-ups, swiping, clicking, dragging. LARGE 38 cm screen, easy to view from anywhere in the room. Two-way, face-to-face video and sound. No emoticons, no ads, no stranger invitations. No usernames or numbers to remember. Each Call button is labelled the way you want; it first calls your contact via Skype, and then tries backup home / office numbers in turn. All with one touch. Managed Skype account and subscriptions. No surprises. Contacts can show photos or their computer screen to Videophone while talking. The user does NOTHING! Just sit back and enjoy. Auto-answer option for nominated contacts, rather than “all or nothing”. Reduces the worry when the Videophone user can’t answer. Note that Konnekt does not represent Microsoft or Skype.